The old maxim by Benjamin Franklin says that “nothing is certain but death and taxes”. As death is certain, so, it seems, is the funeral business. However, today, the $21 billion business of death in the United States faces major challenges, as improved healthcare extends the lives of a progressively aging American population. Aside from the near-term weakness due to lower mortality rates, the funeral industry has become a fragmented and highly competitive business. Still, the industry has favorable long-term growth prospects, as the aging baby-boomers enter the old age life cycle. The death industry in the United States has flourished despite the declining mortality rates and thus the slow growth in the number of deceased persons even with a fast population growth (see graph below). The key reason behind the strong financial performance until recently has been a robust growth in the cost of funeral products and services. 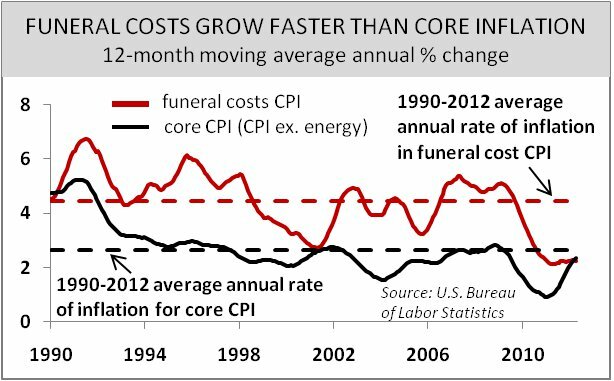 On average, since 1990, the cost of funeral products and services has been rising at a rate double that of the overall core inflation (see graph below). According to the National Funeral Directors Association, the cost of an adult funeral has increased from $704 in 1960 to about $7,323 today. Yet, recently, the traditional industry players, such as Hillenbrand (NYSE: HI), Carriage Services (NYSE: CSV), and Stewart Enterprises (Nasdaq: STEI), have seen their pricing power vanish and their margins squeezed by two new developments: the entry of discount retailers in the casket business and the increasing preference for cremation. Since 2009, two major U.S. discount retailers, Wal-Mart (NYSE: WMT) and Costco (Nasdaq: COST), have been selling a wide range of caskets at major discounts relative to the cost of caskets marketed by traditional funeral service businesses. Moreover, cremation has become very popular. According to Cremation Association of North America, cremations accounted for about 26% of all deaths in 2000. The percentage increased to about 38% of deaths in 2009, and is expected to continue to grow to about 56% by 2025. Cremations, which cost a few hundred dollars to complete, have significantly cut the margins in the industry. Still, it is likely that better days are ahead for the funeral industry. As the baby-boom generation reaches old age, about an estimated 50 million Americans –or 17% of the population– will be 65 or older by 2020. The trend of falling death rates will start to reverse in the 2010-2016 period. 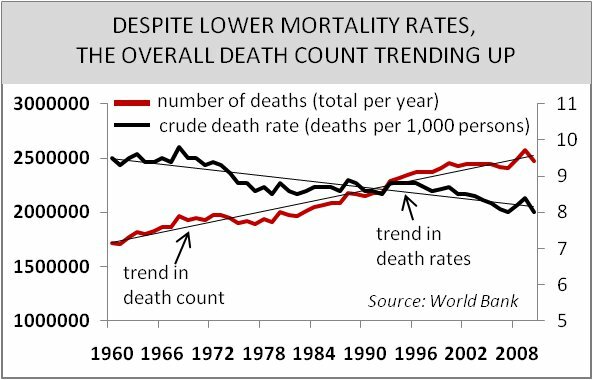 Crude death rates will rise significantly by 2040, when they will reach 9.65 deaths per 1,000 people, about 1.65 percentage points or 20.6% higher than the rate in 2010 (see Death Rate to Jump as Population Ages graph below). This will mean more business for the funeral service companies. Even though the funeral industry is not as stable as it may seem, investors in search for income-generation opportunities can choose among several industry players. 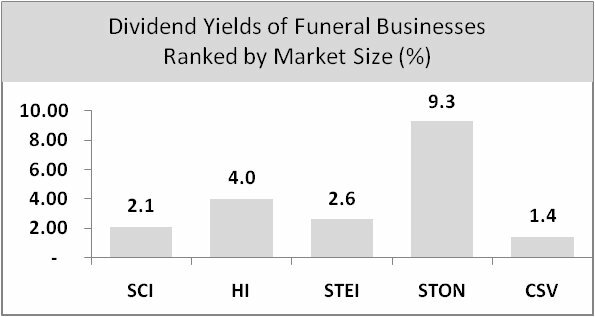 StoneMor Partners (Nasdaq: STON), a $483 million company and the largest owner and operator of cemeteries in the United States, offers the highest dividend yield in the industry of about 9.3% (see Dividend Yields of Funeral Businesses Graph). However, the company has seen negative earnings and free cash flow in the past two years, which raises the questions about the sustainability of its high dividend. Other industry players are good alternatives. Especially attractive is Hillenbrand, which controls almost half of the U.S. casket market. The company pays a dividend yield of 4.0% on a low payout ratio of 43%. It has achieved strong profits and free cash flow over the past decade. Even though the stock is attractive on valuation (see P/E Ratios of Funeral Businesses Graph), it is currently down nearly 17% from the beginning of the year. Also attractive is Service Corp. International (NYSE: SCI), a provider of funeral products and services and an operator of funeral homes and cemeteries. The company has seen positive free cash flow every year in the past decade. 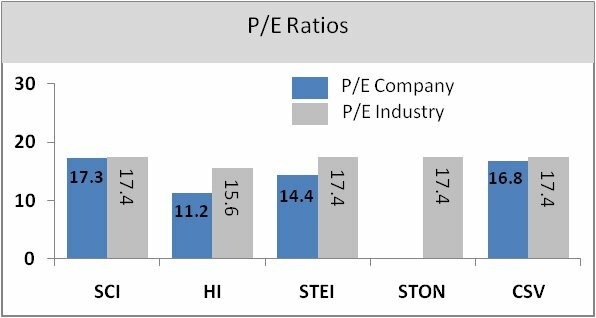 It pays a dividend yielding 2.1% on a low payout ratio of 30% of earnings. The company has been raising dividends at a rate of 12.7% a year over the past five years and has recently bolstered its dividend by an even higher 20%. These examples show that there are opportunities for solid income generation in the U.S. funeral businesses. As the industry trends improve in the future, so will the potential for higher rates of return. Busted Cemetery Business With Lots Of Red Flags, Confusing Accounting, Trading At 14% Yield.